These ridiculously cute little tricksters have been not so subtly making their presence known, much to the dismay of Henry (my ginger cat). So far though they have not been too much trouble, which is not that surprising since they're not really very dangerous. 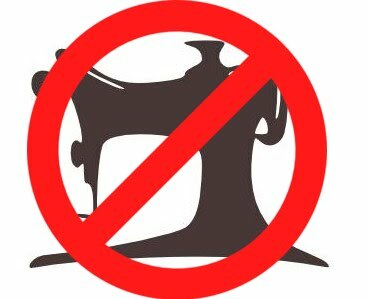 Although I do make sure to protect my ears when I hear their shrill little nonsensical voices approaching. As yet I have only spotted the two pixies but I am certain that there are more waiting to be discovered, which I hope to do once I find the location of their nest. 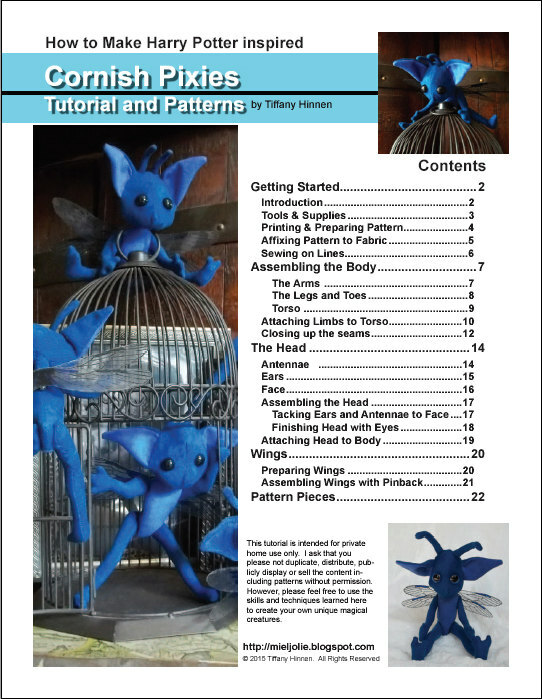 These iconic magical creatures have been expertly designed to resemble Cornish Pixies down to the last detail. The one on the right is made from the original pattern and stands about 9 inches tall from head to foot not including the antennae. 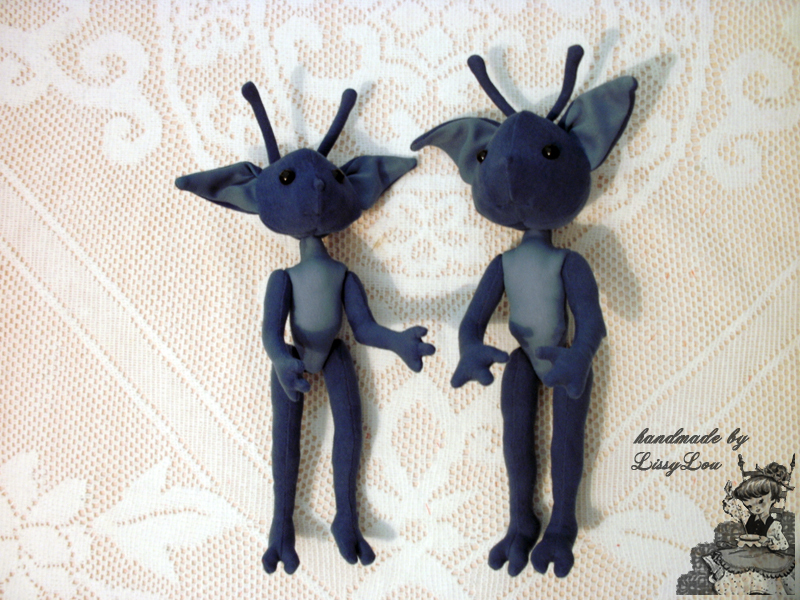 The smaller pixie on the left is made from the recently updated pattern but printed at 85% to create an 8 inch tall pixie as described in the Harry Potter series, again measured from head to foot not including the antennae. Both pixies have jointed arms and legs, bendable wire in antennae and ears, and have the option for removable wings (that I will go into more detail about in Part 2). 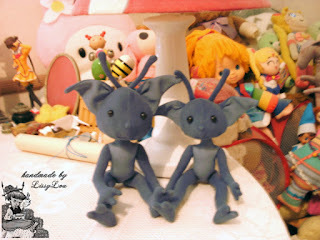 The tutorial for these lovable little mischief-makers provides detailed instructions for making pixies including a full list of all materials and tools needed as well as any optional supplies that may be used. Handy tips and notes to help in the creative process are also found throughout along with a great many pictures to accompany each step in the process. These instructions also provide options for creating single or two tone coloured pixies, fabric covered or plain blue chenille stem antennae, and velcro or pinback removable wings as mentioned in the updated tutorial. As with the Garden Gnome tutorial created by the same talented artist, there are a number of ways here provided in the tutorial to affix the pattern to the fabric before sewing the pieces together, however as a hand sewer I found it easier to cut out the pattern pieces, ignoring the seam allowance, and trace the pattern directly to the wrong side of my fabric using a water soluble fabric pen. 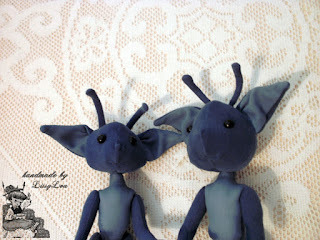 From here on I followed the instructions provided in putting these little blue Cornish Pixies together. 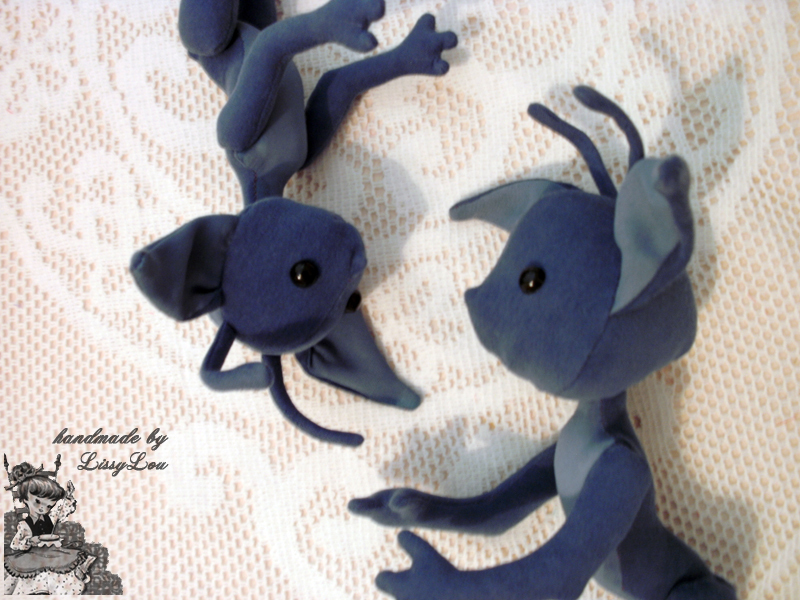 One of the trickiest aspects of creating these creatures has been in turning the sewn pieces, in particular the antennae which are slim and small, however the tutorial has great instructions and tips for this. With this smaller pixie I used the same antenna pattern piece as the original pixie pattern only I shortened the length slightly, as I thought the smaller antenna pattern piece would be a bit too small and difficult for me to turn. The smaller head was also a little awkward to turn with the antennae and ears having wire inserts but the adorable face on this pixie is well worth the effort. This smaller Cornish Pixie is an ideal size to replicate those as found in the Harry Potter series, or possibly to have hanging from your ceiling. The other pixie created from the original pattern is a better size be handled by little hands for play or hugs. At either size they are adorable little tricksters that can be left wingless as described in Fantastic Beasts and Where to Find Them, or there is the option for removable wings to resemble those pixies seen in the Harry Potter movies (more about these wing in Part 2). Tiffany Hinnen (aka. Mieljolie) designed these pixies, you can find her on her blog All Things Crafty, or purchase this pattern on her etsy store HERE. I am a blogger, crafter, amateur artist and creator of handmade gifts. I create in a range of mediums. I am self taught and am still learning. I am constantly inspired but suffer from lack of time, and occasionally motivation. I strive always to create with positive intentions in the hope that all things I make as gifts carry with them those positive thoughts to their new owners. All my sewing projects are made using recycled cloths and fabrics that may once have been part of my wardrobe or other furnishings, such as curtains, but have now found new life in new forms.